Pragmatic Play was formed in 2015 and is one of the fastest growing online casino game providers. The company has a team of over 100 people who combine their experience and talents. These are highly skilled professionals who are behind each fun filled Pragmatic Play release. The company has its headquarters in Sliema, Malta. They’ve been around for less than 5 years, but have already managed to win the Software Rising Star category at the EGR B2B Awards, Best Digital Company of the Year, Best HR Director of the Year and more. You can see the full range of casino slot games here. Beowulf is based on the Old English epic poem. The slot has a nice design- a simple but effective one. The action is set against a moonlit castle backdrop with deep blue reels and game symbols like a horn, silver ring, Beowulf himself and Viking longboat. The white-haired wizard that pays 800 coins for 5 and the flame-haired woman that pays 1,500 coins for 5. There are also diamond, spade, club and heart symbols. Beowulf awards 2,500 coins for 5 on a payline. He awards payouts from either side left or right. * Wild symbol- The game’s wild symbol can substitute for all the other symbols except the scatter. 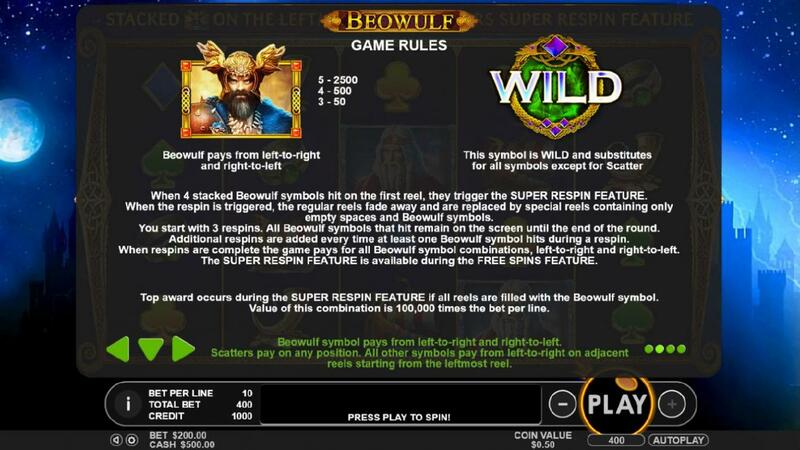 * Super Respin feature- This feature is activated with the help of Beowulf. If he lands fully stacked on the 1st reel 1, it becomes active. All other symbols are removed from the reels except Beowulf and respins start where it’s just Beowulf and blanks on the reels. The stacked Beowulf sticks on the 1st reel and if any other Beowulfs land they stick on those reels too. The respins go on as long as more Beowulfs are added onto the reels. The feature ends when no other Beowulf symbols hit the reels or fill the entire reels. If you land a win here it can go up to 2,500x your stake. how many land on the reels. The Super Respin can also feature during the free spins. You can also reactivate the feature for a total of up to 40 free spins. Want more slot bonuses, check this out. 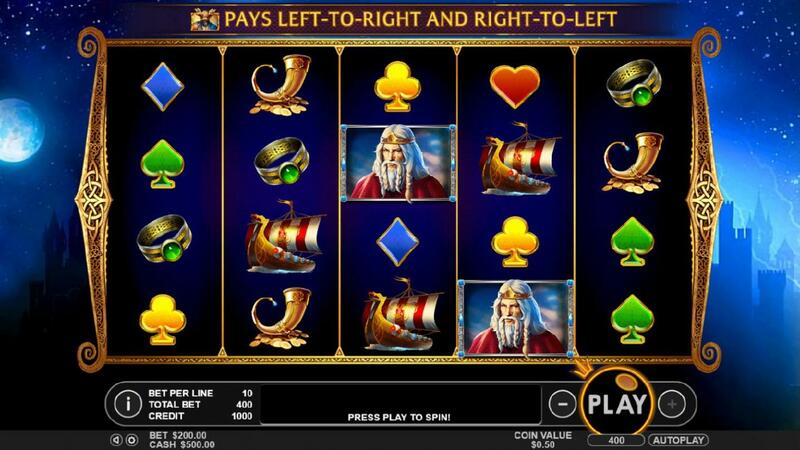 Beowulf is a simple and entertaining slot. It has well-produced visuals and a fitting soundtrack. The game has fun bonus features that don’t take long to activate. The Super Respin feature occurs pretty frequently and offers a lot of winning potential. Combine it with free spins and you get some pretty epic payouts. 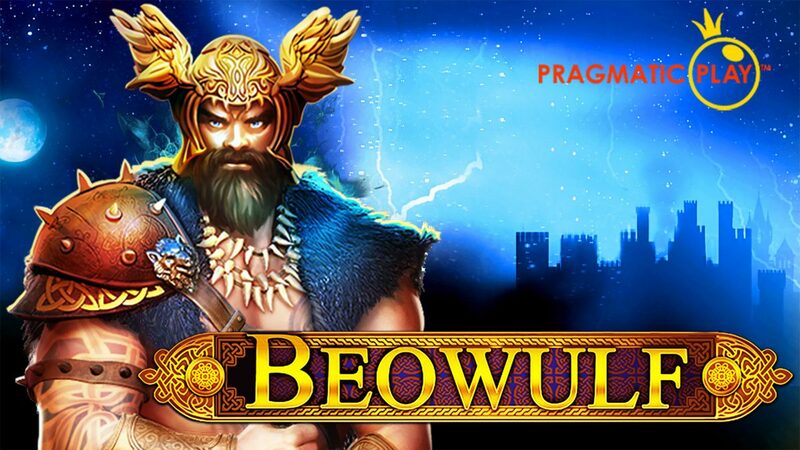 If you enjoyed Beowulf why not try other online Easy slots, click here!